Sela the chocolate enabler organises events for the Chocolate Club. Rarely eats savoury food. It all started nearly 5 years ago, to be precise on 18th November 2006 was the first Chocolate walk. We started the walk in Notting Hill and finished in Victoria station. We visited Melt, Demarquette, Rococo on Kings Road and Artisan du Chocolat in Sloane square. It was the most tasty walk I have been on! I liked the way we learnt about the chocolate that we tasted! I attended Sela's chocolate walk shortly before Easter 2007. I remember it was Easter because there were lots of lovely chocolate eggs in the shops we visited! There were lots of attendees, mainly women (we obviously like chocolate more than some men!) 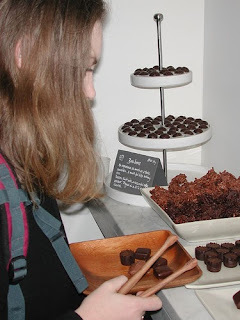 and we visited chocolatiers in the Chelsea area. They were very fine shops including Roccoco on the Kings Road and l'artisan du Chocolat a stones throw from Sloane Square. Most shops allowed you to taste their chocolate so you could experience it without buying if you were on a budget. However, if you do purchase something in each shop it could result in an expensive day out! A nice, enjoyable walk especially if you have a sweet tooth!